Right now we are waiting for new William SELBY Landscape Art to arrive at the gallery. In the meantime, here is a wider selection of the artist's work featured at the Red Rag British Gallery. William Selby was born in Yorkshire in 1933. He is the eldest Son of William Selby a Yorkshire coal miner. Selby followed in his father's foot steps and for a period worked in Coal Mining. He also worked in the Engineering and Insurance industries, but a love of contemporary painting has been a recurring theme to his career. A self taught artist William Selby has been painting professionally for nearly 50 years and is now recognised as one of the leading British 'colourists'. His personal style has undergone significant change over the years. During the 1970s and 1980s, Selby worked mainly with figures as the subject matter.Since then he has become known for his still life and landscape paintings. For his still life art works William Selby positions everyday objects in carefully crafted suspended space producing balance and sustainable interest. Selby's landscape paintings are full of atmosphere with patchwork fields arranged into a vivid abstract design. The landscapes are typically inspired by his native Yorkshire for which he retains a passionate interest. William Selby paints using oil, acrylic and mixed media. His art works display a confident and direct approach with a strong, bold use of colour and vibrancy, which are developed by applying layer upon layer with painterly brushstrokes heightening the sense of depth and texture. In recent years Selby has emerged as an important name in British Art. His contemporary paintings have created an impressive following and Selby has exhibited at the principal Academies, Institutes and Societies of Arts, where he has won many major art awards and fellowships. William Selby is an elected member of The Royal Institute of Oil Painters, the Royal Water Colour Society, the Royal Society of British Artists, New English Art Club and the Royal Society of Painters in Watercolour. Today William Selby contemporary paintings are in collections worldwide. 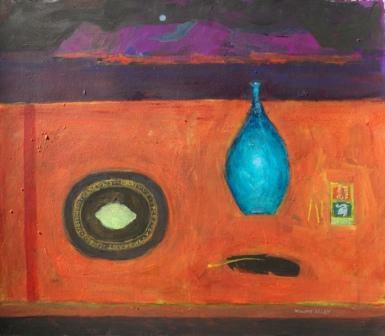 In addition to Red Rag British Art Gallery William Selby has exhibited at other leading British Art Galleries. Each painting at Red Rag is sourced from the William Selby artist studio and like all Red Rag British art and Contemporary art it can be shipped worldwide.